Dressed in black and tossing about her trademark maroon locks, US soul diva Chaka Khan didn't come to play. Commanding a room full of journos and photographers, the 66-year-old took on a pensive mood as she fielded questions. This is the first time the 10-time Grammy Award winner will be headlining the Cape Town International Jazz Festival, although not her first visit to SA. With an illustrious career spanning 40 years, she's collaborated with many artists, from Ray Charles to the late Whitney Houston. But it seems it's her love of hip hop that gets her the most excited. "Hip hop is second nature to me. I grew up in Chicago listening to the Lost Poets. I lived with rap, so getting involved was a natural progression for me. It's communication and connecting with people through the word," she says. 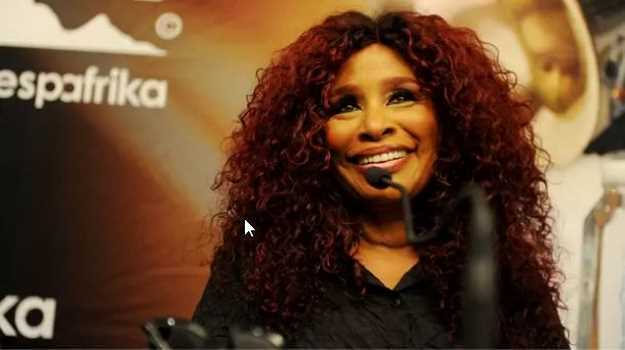 Her CTIJF appearance comes hot on the release of her first album in 12 years, titled Hello Happiness, and even though her absence from the music scene for the past couple of years has been noted, she's excited for her 100% Chaka performance. "It's me pimping myself instead of other people pimping me," she laughs. "I'm all about soundtracks now and looking at a passive income." Her tremendous range and being one of the original Motown divas has given her a longevity that transcends culture and age. "By the grace of God, I'm blessed," she coyly responds when asked how she manages to perform at the highest level. Many don't know about her involvement with the Black Panther movement in the late 1960s - it's something she's proud of, as she should be. And even today, she takes a keen interest in the challenges the black community faces. "When people are being mistreated, you should slap them outside their motherf*cking heads so they know they are doing wrong." What makes her performances so unforgettable? Khan gets straight to the point: "I am anointed. It's sheer talent when hitting the high notes."